There are 4 official DM trainings every week, which are all led by a trainer of UM Sport or someone of the board. The trainings are at Tuesday evenings, Wednesday afternoons and Sunday mornings. 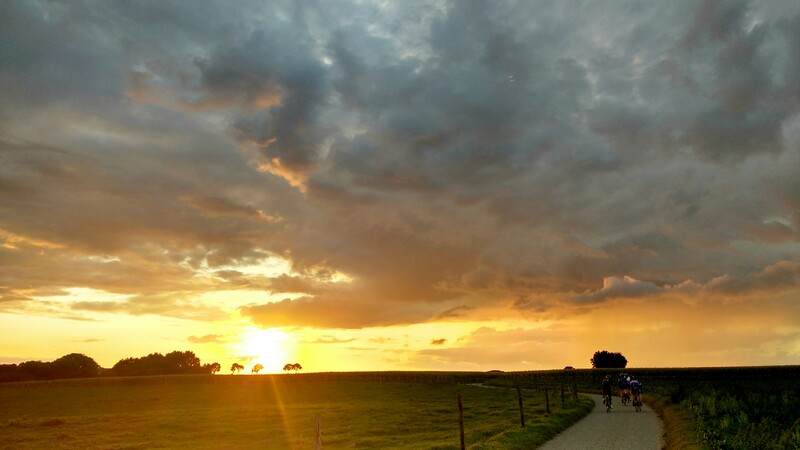 The trainings on Tuesdays start at 6.00 PM for a ride of approximately 50 till 80 kilometers (depending on the weather and at what time it starts to get dark), and is led by a board member. Once it’s winter time the bikes are exchanged for spinning sessions at the sports center of the university, where you can exhaust yourself for one hour. On Wednesdays there are two trainings: the first one starts at 1 PM for more experienced cyclists, meaning that there will be a two hour ride at a pretty high pace (around 30 average). The second training starts at 3 PM which is accessible for all members of all levels. Both trainings are led by a trainer of UM Sport. The content of both trainings do not change in the winter, but they start 30 minutes earlier then. The training on Sunday morning starts at 10 AM for a ride of one and a half till three hours, depending on the weather. This training is led by a board member and does not change in winter time. There are two official trainings for all mountain bikers every week: one on Tuesday evening at 6.30 PM for a ride of one hour till two and a half, depending on the weather. These trainings are only in the summer, in the winter the mountain bikers can also attend the spinning sessions. The second training is on Sunday for a ride of one till two and a half hours which also depends on the weather. This training does not change in the winter.